Juventus boss Massimiliano Allegri says "only a madman" would bring children to games after trouble in the Turin derby. 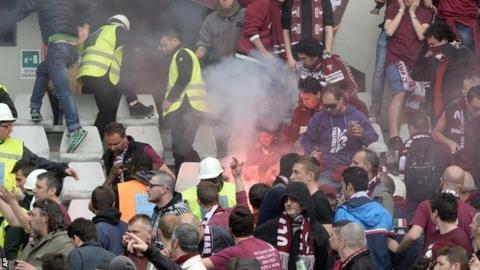 Torino fans were injured when a paper banger exploded during Sunday's Serie A game, a surprise 2-1 win for the hosts. Allegri said: "In Italy we are still behind. Until the responsible parties take measures this is how it will be. "We need to improve to bring people back to the stadium and kids first of all, given that only a madman would bring them along." The missile that injured at least 10 Torino fans was thrown from the Juventus end in the first half and caused splinters from seats to injure home supporters. A second explosive thrown later on hurt another fan. A club statement read: "Juventus condemns all forms of violence whether it be coming from their fans or those opponents. The facts today require a deep reflection on the part of football."